Synthetic Grass Landscape Options | Turf Etc. Synthetic grass creates a beautiful first impression in your front yard and can even help you transform your backyard into the most relaxing hideaway. Synthetic grass goes above and beyond boring lawn surfaces. At SYNLawn Kansas City, we create custom landscape designs that combine natural elements with entertaining features that will bring your family closer together. We believe everyone should spend more time using their lawn and less time taking care of it. Get your weekends back this summer with our expertly installed landscape options. We offer multiple applications that can be installed at residences across Kansas City, Missouri. 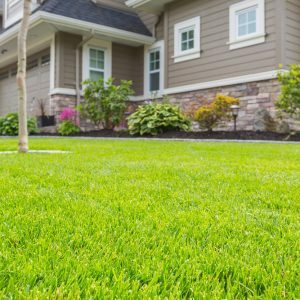 Whether guests are coming to visit or you’re trying to increase your home’s value, a front yard synthetic grass installation will impress everyone who sees it. Our installation team carefully considers HOA restrictions, personal preference and your budget to find the right turf system for your home. Some areas only grow a certain type of grass and some HOAs only allow specific variations of grass. We combine different shades of green blades and thatch to create a synthetic grass that blends seamlessly with neighborhood standards. Get the best of both worlds! Homeowners don’t have to give up their living landscapes. We install turf around flower beds, trees, and shrubs to effortlessly tie together natural and synthetic features for a one-of-a-kind finished look. There is nothing better than relaxing in your backyard during the warmer months. However, brown patches and lack-luster landscaping can put a damper on the enjoyment of your backyard. The front yard of a home is reserved for impeccable landscaping, which means the backyard is the perfect place to showcase your personal style and have a little fun with your landscape design. Just like we would in a front yard, we can install synthetic grass around patios, decks, pools, and living landscape features. SYNLawn also offers safe playground turf and custom artificial putting greens, so everyone in the family has a place to call their own in the backyard. Our kids are often the ones who get the most out of the backyard. Whether you have a swing set or the kids need a place to let their imaginations soar, they can easily cover every inch of your lawn in just one afternoon. If you have natural sod in your yard, your children can track in mud and dirt, not to mention kill real grass that you have spent months and months preparing for summer. Kansas City parents with a synthetic lawn don’t have to deal with mess being tracked into the home. Even better: their lawns never die from heavy use. Add peace of mind by installing SYNLawn turf under swing and play sets at your home. Our products meet the standards set by the International Play Equipment Manufacturers Association (IPEMA) which protects children from falls up to 10-feet. Kids will be kids, which means they’ll fall down a time or two. Our turf absorbs these falls to prevent injuries for a safe and worry-free play time. We offer synthetic grass systems that are made specifically for pets that provides a sanitary and pest-free space for pets of all sizes. Our pet systems offer higher drainage rates at 90-inches per hour to account for liquid pet waste. We also install all pet grass with Envirofill infill complete with Microban antimicrobial protection. This works to combat pet odors and stains caused by pet waste so you can your family can still enjoy your outdoor space comfortably. Synthetic turf eliminates pests like fleas and ticks to keep your pets safe, as well. Get your short game exactly where it needs to be without ever leaving your house. SYNLawn Kansas City offers putting greens that mimic the surface at your favorite golf course. This means you can take what you learn at home directly to the course and lower your scores. We offer different surface textures that are custom designed to fit the space you have available. We customize these putting greens to meet your needs so you can make the most of the time you have to practice. Create a space you’re excited to come home to every day. Whether you’re updating your front yard or backyard, our team can help you choose landscaping applications that make your home stand out! Contact us today to request your free consultation.